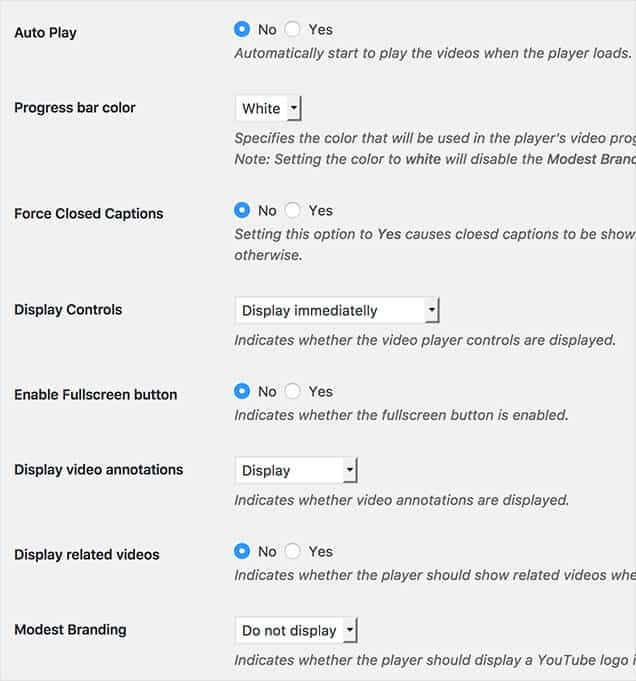 To access the features below, you need the EmbedPress – YouTube Add-On installed and activated. Auto Play: Automatically start to play the videos when the player loads. Progress bar color: Specifies the color that will be used in the player’s video progress bar to highlight the amount of the video that the viewer has already seen. Force Closed Captions: Setting this option to Yes causes cloesd captions to be shown by default, even if the user has turned captions off. This will be based on user preference otherwise. Display Controls: Indicates whether the video player controls are displayed. Enable Fullscreen button: Indicates whether the fullscreen button is enabled. Display video annotations: Indicates whether video annotations are displayed. Display related videos: Indicates whether the player should show related videos when playback of the initial video ends. Modest Branding: Indicates whether the player should display a YouTube logo in the control bar. We recommend you to use the license key to receive automatic updates for this add-on in future directly into your WordPress site. Read this tutorial to know how to activate your license.